Spot gold prices fell sharply today resulting in prices breaking below both the 9 and 14 day moving averages as a result and, in addition, breaching the $1200 per ounce level. Following the recent pause for the gold market, as outlined in my previous market commentary, the strength of this move lower was a surprise and certainly not what I was expecting at this stage which was a continuation of the recent bullish rally. However, for longer term trend traders this pullback should be seen as a buying opportunity as I believe the longer term upwards trend will be reestablished in due course, particularly given the strength and depth of consolidation now sitting below to support any upwards move. 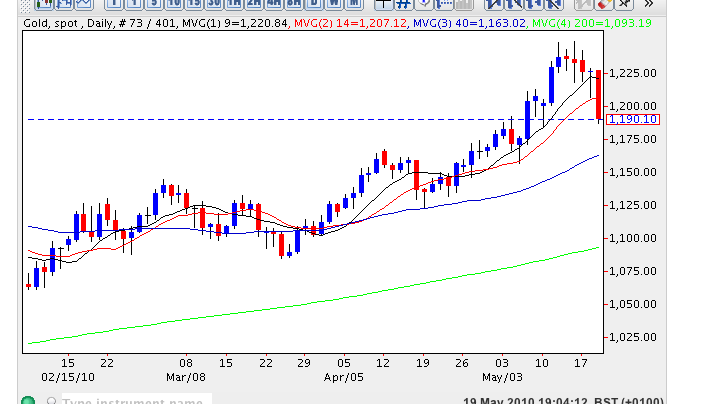 However, if the 40 day moving average is breached then this could signal a retest of support back at $1150 per ounce although it is my view that this is unlikely to occur.